Gordon Kirby has rang up a few chassis makers and got them on record re: reaction to the IndyCar Festival of Holograms last week. This is a process known as "journalism." I'm kind of surprised, frankly, that more journalists aren't picking up the phone and trying to get the chassis makers on the record for their customers (readers). Hope they're not just sitting around waiting for a news release. Also, Marshall Pruett has a Q&A with Randy Bernard here. Worth a look. Lot of TBD in there, still. The way I read the release below is, Swift is out of IndyCar creation derby. I'd say the second paragraph below is a "congrats to Dallara, but we're out." But it's carefully worded, so I guess it could also be read as "Never say never." In my view, Swift was easily the class of the field in fan outreach and involvement and their designs caused me to have a physiological reaction, if you get my drift. Unfortuantely, fan outreach and engagement counted for JACK in this chassis derby. More's the pitty. Huge ups to chief engineer Mark Page for being eager to talk about Swift designs, the entire Swift posse for seeking fan involvement and to @pinkgineer for her one-woman Twitter fan relation show. DeltaWing issued the release below saying "congrats, but we're out." As I said before, the DWings deserve mad props for having the courage to offer something truly radical to the party. While it probably proved TOO radical -- and I personally did not dig it -- there's no doubt in my mind that the DeltaWing proposal was the forerunner of the current approach. At least it gave everyone the idea for the current approach. Some will argue the ICONIC committee totally bogarted DWing's idea for opening up vast areas of the car to development. I found DWing's Ben Bowlby and Bill Lafontaine easy to work with, responsive, quite cordial and willing to have an honest, respectful exchange of views. Racing could use more of that attitude. After half a day to think about it, my impressions of the Spectacular 2012 Hinge Point of History IndyCar Awesome-Amazing Announcement is ..
Don't get me wrong. The concept is solid. Have a common "safety cell" -- tub, gearbox, etc. -- and open development of sidepods and wings up to everyone, subject to an inches-thick rule book, no doubt. Yeah, I get that. And it's interesting. It adds variables and at least offers the chance that innovation, not raw dollars, will play a greater role. But it's also still all on paper right now. SCOTT HOKE: Sarah Fisher is here with us today for this afternoon's announcement. There will be more drivers here. Sarah, first of all, are you excited about this announcement? SARAH FISHER: I'm very excited. I think there's been a lot of work put into it. The future of the IZOD IndyCar Series is strong and we're really happy to be here and happy to be a part of it. INDIANAPOLIS (July 14, 2010) – The future is here, and it’s innovative, open and competitive. 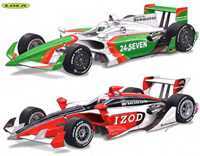 The IZOD IndyCar Series unveiled July 14 its new car strategy for the 2012 season and beyond, featuring a rolling chassis with an enhanced safety cell produced by longtime series partner Dallara that will be covered in changeable bodywork created by various manufacturers. Welcome to D-Day. An impressive news conference is set for 12:30 p.m. at Indianapolis Museum of Art, in Indianapolis, where the new chassis (a rare word that is both singular or plural) or guidelines for a chassis, will be announced. Fans can tune in to LIVE video coverage of the announcement on IndyCar.com. The decision on the 2012 IndyCar was supposed to be made by today, June 30. IndyCar CEO Randy Bernard has said recently that the decision might be made by today, but the announcement won't be for a week or two. UPDATE: Indy Star's Curt Cavin reported Wednesday afternoon the announcement will be on July 14. The contenders are Dallara, DeltaWing, Swift, BAT and Lola. Check many posts on them all here. Hope springs eternal for a multiple-chassis ruling, but several chassis makers have said unless they can have the economy of scale of supplying the whole field, they can't afford to offer a chassis at all. To be clear, I do not like the DeltaWing concept car. Primarily because it does not fit my definition of "car," that being roughly rectangular with four corners. Therefore, I hope the ICONIC advisory board does not recommend the DeltaWing as the 2012 IndyCar. I do think we should all give the DeltaWing developers props in several key areas.